0.2-2Liter Semi Water Filler Included Three Part. 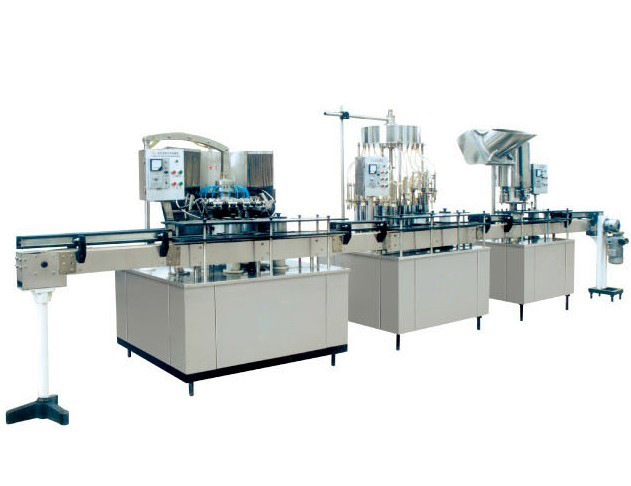 It is one of the most versatile medium speed rinser available anywhere.It is designed to effectively internally rinse up to 3,000 small bottles per hour/50 bottles per minute.It’s ideal for rinsing bottles ranging in size from 12oz (335ml) up to 2liters.The change over from one size bottle to another couldn’t be easier.It takes literally minutes and no tools are required nor are there any special molds or adapters required for the change overs. CY-12 Normal Pressure Filler& 24 Foot automatic conveyor System: It is designed to automaticlly fill up to 3,000 bottles per hour and provides maximum versatility to keep pace with the demands of your operation.It is designed and built to operate multiple shifts with a minimum of the maintenance and does not requir highly skilled operators.The stae-of-the-art design and components offer maximum performance,reliability and versatility to fill from 335ml up to 2liter bottle. FXZ-1 Screw Capper is also one of the most unique capping systems available.To begin with,the filled bottles first enter the build-in Bottles Spacing Mechanism.The bottles spacer allows for precise and constant bottle spacing while entering the Cap Applier.This correct spaceing ensures that your caps are applied evenly and consistently with the most accurate alignment possible.In preparation for cap appliation,caps are first moved,from the shipping carton,into the Cap Hopper. This filling machine accomplish whole process from washing, negative pressure,filling, settle cap, buckle cap till screw cap. The whole package production line adopt stepless speed regulation having advanced structure, it works placidly and reliable and easy to operate and maintain have low failure rate. It is a ideal equipment for small and medium beverage enterprises.